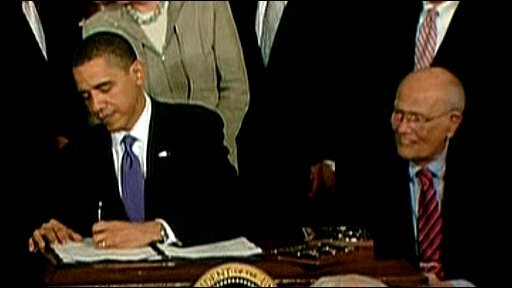 US President Barack Obama has signed his landmark healthcare bill into law in a ceremony at the White House. The new law will eventually extend health insurance cover to about 32 million Americans who currently do not have any. Mr Obama said he was signing the bill for people like his mother "who argued with insurance companies even as she battled cancer in her final days". The bill is strongly opposed by the Republicans, who say it is too costly. Immediately after the signing, attorneys general from 13 states - 12 Republicans and one Democrat - began legal proceedings against the federal government seeking to stop the reforms on the grounds that they are unconstitutional. Mr Obama was joined at the White House signing ceremony by healthcare reform supporters including Democrats from both Houses of Congress who supported the measure. He said the bill's provisions were "desperately needed", adding: "The bill I'm signing will set in motion reforms that generations of Americans have fought for and marched for and hungered to see." He hailed the "historic leadership and uncommon courage" of the Democratic leadership in Congress that secured the bill's passage, singling out House Speaker Nancy Pelosi and Senate Majority Leader Harry Reid for particular praise. He concluded: "Today after almost a century of trial, today after over a year of debate, today after all the votes have been tallied, health insurance reform becomes law in the United States of America. Today. "All of the overheated rhetoric over reform will finally confront the reality of reform." Mr Obama now has to sell the reforms to a divided American public before November's mid-term elections. On Thursday, he will go to the state of Iowa to talk about how the new law will help to lower healthcare costs for small businesses and families. Q&A: What next for health reform? Now for a climate bill? After a heated debate, the House of Representatives voted 219-212 late on Sunday to send the 10-year, $938bn bill to Mr Obama. Not one Republican voted for the bill, and some Democrats also voted against it. The measure, which the Senate passed in December, is expected to expand health insurance coverage to about 95% of eligible Americans, compared with the 83% covered today. It will ban insurance company practices such as denying coverage to people with existing medical problems. Correspondents say the bill represents the biggest expansion of the federal government's social safety net since President Lyndon Johnson enacted the Medicare and Medicaid government-funded healthcare programmes for the elderly and poor in the 1960s. Mr Obama's campaign to overhaul US healthcare seemed stalled in January, when a Republican won a special election to fill the late Edward Kennedy's Massachusetts Senate seat, and with it, enough Republican votes to prevent the bill from coming to a final vote in the Senate. But Democrats came up with a plan that required the House to approve the Senate-passed measure - despite its opposition to many of its provisions - and then have both chambers pass a measure incorporating numerous changes after the president signed it into law.